In the first years following the end of the Civil War the family of S. V. Hoffman lived in the imposing residence at No. 210 Fifth Avenue, between 25th and 26th Streets. Like his equally-wealthy neighbors, Hoffman lobbied against the concept of an "underground railway," or subway, that would rattle his quiet and refined neighborhood. In 1870 he joined other millionaires like William B. Astor, A. T. Stewart and Peter Gilsey "against the scheme," as reported in The New York Herald. 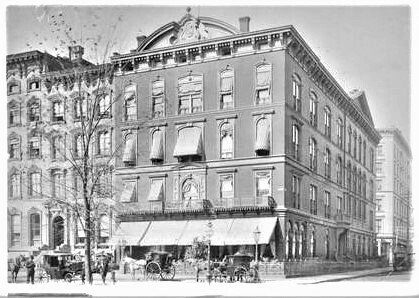 The Hoffman mansion did get rattled some in 1876 when Delmonico's razed the two houses next door at Nos. 212 and 214 and erected its newest restaurant. The arrival of the society restaurant and caterer did not affect the upscale tenor of the block, however. Nevertheless, the incursion of commerce into the refined neighborhood was close behind. The Hoffman family threw in the towel in 1884. Although they wisely retained possession of the valuable property, The Real Estate Record & Builders' Guide reported on June 7 "At No. 210 Fifth avenue, running through to 1130 Broadway, Mrs. G. R. Hoffman is to erect an eight-story store and flat costing $98,000." The mention was rightfully listed under the heading "Costly Buildings Projected." The price of construction would equal more than $2.5 million today. The new structure contained apartments on the upper floors and a store at ground level. The shop was home to Redfern dress makers, a favorite of actress Lillian Russell. By the turn of the century the last of the wealthy homeowners had abandoned by immediate neighborhood. Keeping up with the increasingly commercial transformation, the Hoffman family demolished its eight-story building in 1901 to replace it with a multi-use building. They had already negotiated the details with the intended tenant. On November 30, 1901 The Record & Guide reported that Dean Eugene A. Hoffman had leased "to the Mark W. Cross Co., for twenty years, a new 10-story building to be erected at No. 210 5th av. and extending to No. 1132 Broadway." The architectural firm of John B. Snook & Sons was tasked with producing a four-story store for the London-based leather goods firm below seven floors of high-end apartments. Construction had barely started when trouble ensued. On April 2 The Morning Telegraph reported "The workman who are excavating for a new apartment house at 210 Fifth avenue adjoining the Cafe Martin, set fire to a lot of rubbish last night before going home. The pile smoldered till half past seven when it broke out in a formidable blaze." Thick smoke wafted into the well-appointed dining rooms of the restaurant. "The crowd of diners in Martin's took alarm from the smoke which drifted into the room, blackening the walls and half hiding the startled waiters. Here was a fine beginning for panic." But among the white-tied patrons was a police officer named Mulcahey. The well-to-do cop, said the article, "always dresses for dinner, and always dines at the 'Del' corner." He rose and cautioned the crowd "Peace, good people. Keep your seats, I will protect you." The Morning Telegraph continued "Before the majesty of a white shirted copper, alarm shrank away ashamed." Murphy went onto Fifth Avenue where he went in an alarm. Named the Cross Chambers building, No. 210 was completed before the end of the year. The architects had turned to the popular Beaux Arts style, embellishing the marble facade with swirling French-style iron balconies, frothy cartouches and a two-story copper-clad dormer within the mansard. The Fifth Avenue and Broadway facades were nearly identical. There are at 210 Fifth Avenue, opposite Madison Square Park, apartments of 2, 4 and 6 rooms--of luxurious arrangements and unique design--where bachelors and private families can get all the comfort and privacy of a home--at a reasonable price. French chef--meals served in rooms--maid service for ladies--excellent place for families living in other cities to locate, where rooms and property can be taken care of during absence. Among the early tenants of the upper floors was a Miss Clark, whose apartment doubled as her art studio. 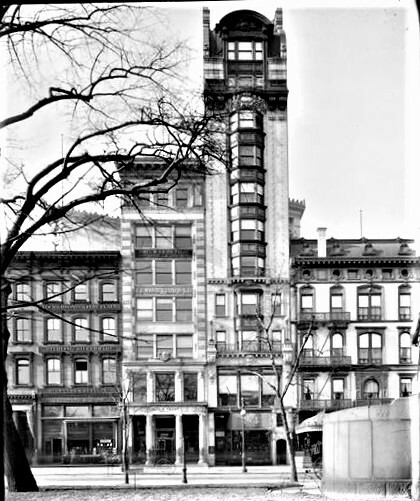 On November 29, 1904 The Globe and Commercial Advertiser announced "Miss Clark will give an exhibition of ceramic art objects in her studio, in the Cross Chambers, 210 Fifth avenue, this week, the work having qualities of originality, and, at the same time, being unique and artistic." If Miss Clark was still in residence two years later, much of her ceramic items might have been broken. On December 5, 1906 The Evening Telegram ran the all caps headline "BROADWAY SKYSCRAPER SHAKEN BY EXPLOSION." The Cross Chambers building was rocked by a "terrific explosion of gas" which blew out nearly all of the Broadway windows. Few of the residential tenants were at home, although maids were temporarily trapped. They managed to escape to the roof of Martin's Cafe. The four floors occupied by Mark Cross, of course, were filled employees and patrons. The article reported "A great burst of flame followed [the explosion] and a score of women and men on the shipping room floor became panic stricken. Plastering and soot from the ceiling smothered them." Fortunately, fire fighters were able to extinguish the blaze before too long and remarkably no one was seriously injured. The Broadway facade is essentially identical to the Fifth Avenue design. When Foster Milliken's wife, the former Louisa Ward, died in 1909, he moved into the Cross Chambers building. He had been the president of the contracting firm Milliken Brothers; but retired from it that same year. The firm's new president was Edward C. Wallace. It seems that Milliken and Wallace shared more than a mutual title. On March 28, 1911 Wallace's wife, Antoinette Knapp Wallace, divorced him in Philadelphia. A month later, on April 22, she and Milliken were quietly married in City Hall in Jersey City. To obtain their license the couple had had to answer questions on the application, one of which was how long they had contemplated marriage. They filled in the blank "two weeks." In the meantime Mark Cross catered to the carriage trade from the lower four floors. In 1911 it offered its pigskin English Toilet Case for men. It accommodated two "military brushes," a tooth powder box, a soap dish, a bone nail brush, and a toothbrush. An advertisement touted it as being "very compact and complete, taking up very little room in a bag or trunk." The $12.75 price tag would be about $350 today. On February 21, 1914 The Record & Guide reported that Robert W. Goelet had selected Warren & Wetmore to design his ten-story store and office building on Fifth Avenue at 37th Street. The article noted "The store and basement have already been leased to the Mark Cross Company." The following year, in July, David A. Schulte, president of the Mutual-Profit Coupon Corporation, leased the Cross Chambers building. The firm operated a chain of cigar stores. Later that year, in August, Schulte sublet the residential floors. The Record & Guide reported that the lessee "will alter the upper portion of the building, which is now composed of small apartments, into a loft building." 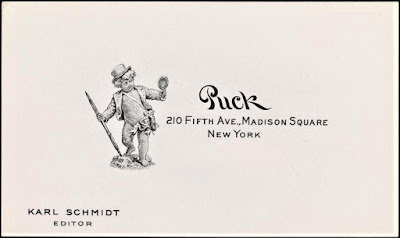 Puck, the humor magazine, took the sixth floor. It was, perhaps, a hint of troubles. In the 1890's the firm enjoyed a circulation of more than 90,000. But it would not survive past World War I. 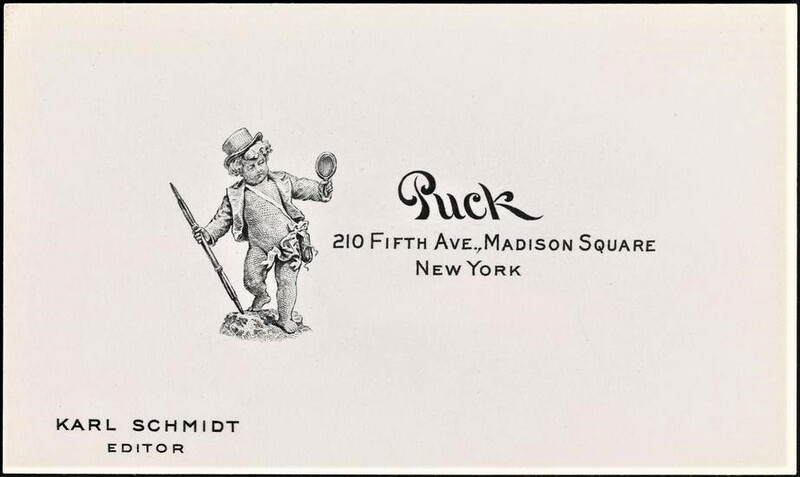 The editor's business card included the iconic Puck figure from its 1886 building at Lafayette and Houston Streets. The chain of A. Schulte cigar stores was touted as the "largest independent retail cigar dealer in America." It ran 34 shops in Manhattan alone. But the ground floor store at No. 210 Fifth Avenue was higher-end. It was deemed a "premium parlor." The cigar store, however, was short-lived. The first through sixth floors were leased for the Bundle Day Headquarters in 1915. A year before, in July, a major financial crisis which began in London spread around the world. Fearing a run on the banks, officials closed the New York Stock Exchange on July 31, 1914 and it would not open again until November 28. The Financial Panic of 1914, nearly forgotten today, resulted in thousands of people out of work and desperate. The Bundle Day Committee was formed by wealthy socialites with names like Speyer, Astor and Vanderbilt. Citizens were urged to bundle up their unused clothing to be distributed to the needy. An advertisement on February 3, 1915 read "Don't delay another minute. Pick out your unused clothing now. Put it to work. Put it on the backs of the unemployed. They need it. You do not. They are cold. You are not. They haven't clothing decent enough to let them even apply for a job. You have all the clothing you need--and to spare." On February 6, two days after the event, The Sun reported "A well dressed woman ran into the Bundle Day headquarters at 210 Fifth avenue yesterday afternoon and asked the information clerk where the bundles of shoes were kept." She explained that she had accidentally included "one good shoe" in her bundle. She was sent to the fourth floor, "a room filled mostly with shoes." The newspaper said "Just how many shoes there were couldn't be guessed, but there were so many that the woman lost heart." The point of the article was to illustrate that between 500,000 and 1 million persons had sent in bundles of clothing. Not all of the topmost floors had been converted to loft spaces. On November 19, 1916 The Sun ran an article on the "newest feature of New York life." It explained that many city dwellers had taken to the roofs, planting gardens in outdoor spaces connected to their apartments. Included in them was Mrs. Charles B. Patterson. 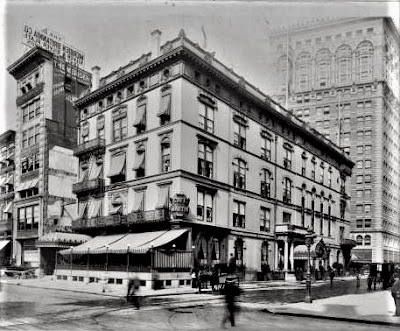 The article noted "Mrs. Patterson is now having made over for her residence and studio the deck house on the roof of the Cross Chambers at 210 Fifth avenue, an eleven story building facing Madison Square." 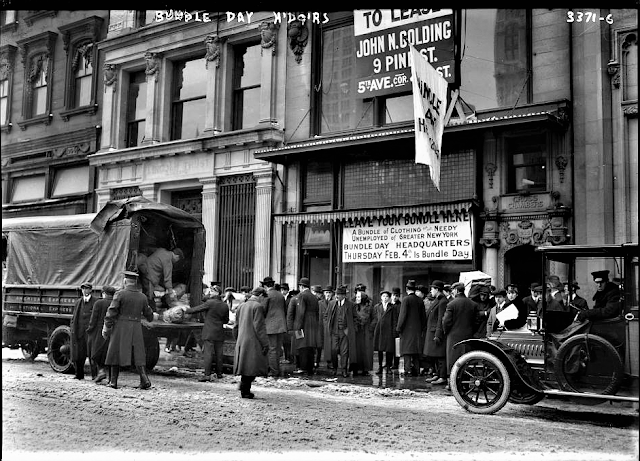 World War I brought the American Ambulance in Italy offices, those of the the American Allied Ambulance, and the Food Embargo Committee to the building. The Food Embargo, proposed by Brooklyn Congressman John J. Fitzgerald early in 1917, deprived Germany of food staples, like potatoes, by stopping shipments at their source and by naval blockade in Europe. On February 3, 1917 The Brooklyn Daily Eagle noted "A protest mass meeting was held in Carnegie Hall last night, under the auspices of the Food Embargo Committee of 210 Fifth avenue." Other tenants in 1917 included W. T. Smith & Son, Inc., carpet dealers; the Niles Normalizing Machine Co.; and Bull Publishing Company. Like other businesses owned by German-Americans, Bull Publishing ran afoul of the United States Government that year. Who were not and never have been our foes. "'Bull' has been debarred from the mails, in violation of the Constitution of the United States...The right to free press is not only the right to print but the right to read, and in debarring 'Bull' the Administration had interfered with the rights of thousands around the country." A variety of tenants filled the building after the war. Bull Publishing was still here in 1919, the year that the Rivoli Waist Co. took part of the sixth floor. The French American Fashion Publishing Company was looking for a "first class fashion crayon artist" in May of that year. The Personal Phonograph Record Co. leased space around the same time. On December 16, 1921 it announced a new feature, saying "A Phonograph Recording Laboratory has added a new department to their activities and can offer to musical artists a personal phonograph record of their own work for a nominal charge. "$35 will cover recording and one dozen records." That price would be about $491 today. The building was renovated in 1954, adding a penthouse level, unseen from street level, and reintroducing apartments into the building--two each on the third and fourth floors, and mingled in with offices in the upper levels. Those offices would be home, for the most part, to a few questionable businesses for several decades. In 1963 the International Employments operated here, offering "guaranteed work" to unemployed persons nationwide for only a $10 fee mailed into the office. And in July 1972 New York Magazine warned its readers about "Ritzy Rifters" in its Consumer Beware column. Included in the list was Claudie Enterprises, Ltd, a mail-order company here. In December 1979 Marvin Barnes was arrested on 188 counts of grand larceny, forgery, and other offenses. The New York Times explained "Mr. Barnes allegedly used fraudulent Social Security numbers to go with fraudulent names and is accused of having reported falsified incomes...from nine different addresses." Federal agents said "The address most often used was 210 Fifth Avenue." Of course legitimate offices and businesses operated here at the time. In 1973 the Top Tile Store was in the ground floor, and The New York Age, a magazine headed by Adam Clayton Powell 3d, took space in 1974. On April 21 that year The Times reported "The New York Age, a firebrand fighter of racial injustice that died in the nineteen fifties, its zeal spent, was born again Thursday with its demeanor changed but its aim primarily the same." Former Olympian Charlie Mays had his office here, where he worked full time on establishing a permanent Black Athletes Hall of Fame. He had founded the institution in 1972 and it was temporarily housed here. In December 1973 an underground nightclub, The 210 Club aka Harold's Loft opened in the building. It was described by Steven Blush in his 2016 New York Rock: From the Rise of The Velvet Underground to the Fall of CBGB as "an infamously decadent weekly after-hours joint." It closed in March 1975. In 1986 the Better Business Bureau of Metropolitan New York set up a department to monitor mail-order companies. In the first six months of operations it received more than 4,000 complaints, and among the five top companies listed was Favorite Fragrances of No. 210 Fifth Avenue. Customers complained that they either never received the goods ordered, or that they were defective. But as the 21st century neared, a renaissance in the Nomad neighborhood changed all that. In 1996 Dewey's Flatiron was opened in the former Mark Cross space. The two-story bar and restaurant would remain for 18 years, closing in 2014. It was followed by Wagamama, a British-based Japanese food chain, still in the space today. Although the storefront and entrances have been lost on the Fifth Avenue side, the unique Cross Chambers building remains wonderfully intact--a Beaux Arts beauty which, in several respects, anticipated the Art Nouveau buildings to come. So cool that you found the posting. You were quite a slice of the building's history.